Downtown San Jose has ambitious plans for Super Bowl Week. Plaza de Cesar Chavez is going to be transformed into the epicenter of South Bay festivities thanks to $150,000 in privately funded improvements (split between the Adobe Foundation and the Knight Foundation). The trees will be lit with animated LED displays that are synchronized with both live and recorded music. There will be a new cafe and beer garden open from noon until 10pm and well as food trucks along the perimeter of the park. They will even have games for visitors such as a scaled-down football field and ping pong tables. Some of the attractions will be used to showcase what can be done in urban parks, while some others like lighting improvements and new furniture will be permanent. That is a big win for our top park in Downtown San Jose. Hopefully we will do more events like this in the future. A permanent cafe in the middle of the park would not be a bad idea either. 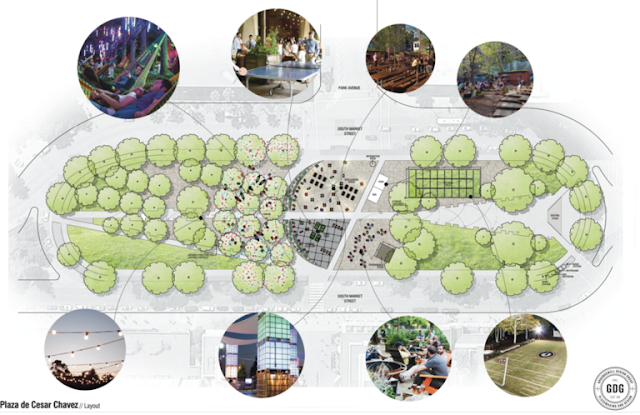 You will be able to check out the new and improved Plaza de Cesar Chavez from January 29th to February 7th.